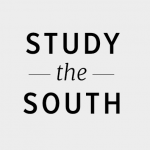 The Center has just launched a new journal, Study the South. Study the South is a peer-reviewed, multimedia, online journal, published and managed by the Center. The journal exists to encourage interdisciplinary academic thought and discourse on the culture of the American South, particularly in the fields of history, anthropology, sociology, music, literature, documentary studies, gender studies, religion, geography, media studies, race studies, ethnicity, folklife, and art. Study the South takes the form of a command and is therefore something of an unusual title for a journal. The commands are to take seriously both the subject matter and the methods of study, to conduct the study as part of a community of scholars, and to study in ways that address topics of lasting importance. Study the South also offers an invitation to join the effort to expand the questions, methods, and topics of Southern Studies. It encourages innovative approaches or, as Eudora Welty wrote, “all serious daring.” In encouraging interdisciplinary scholarship, it encourages work that not only tells about the South, to paraphrase William Faulkner, or documents the South, or interprets the South, but work that uses all the tools available to good scholars. Study the South is not primarily about drawing grand conclusions about what distinguishes or defines the South. It is not especially about where the South exists, or whether the South still exists. Articles may address all of those questions, but above all Study the South looks to raise and address new questions. This journal appears as the Center for the Study of Southern Culture is bringing to an end several years of comprehensive encyclopedia projects, and Study the South hopes to continue some of the defining features of those projects—the idea that everybody and everything matters, that all people deserve serious study, and that scholarship must change to address new issues and audiences. The single-article focus of Study the South will, we hope, focus the reader’s attention on essays of high quality and significance. Some future issues of the journal will include calls for papers on topics the Center for the Study of Southern Culture has defined, and others will come from submissions from authors. The journal’s place on the website of the Center for the Study of Southern Culture connects it to a wide range of efforts in Southern Studies. We welcome you to Study the South. Now, for Study the South’s first article by scholar Jennifer Wallach of the University of North Texas. Wallach explores the foodways of black nationalism.